It seems like every weekend lately, it has either rained or has just finished raining so much that the trails and rocks are all soaked. 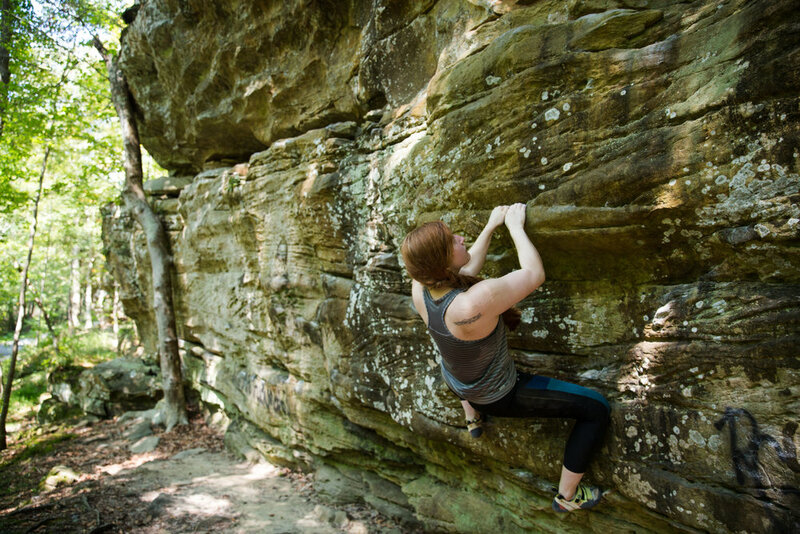 Finally, this weekend everything dried up enough that I was able to grab a friend and head out to the local crag at Clifty Hollow. 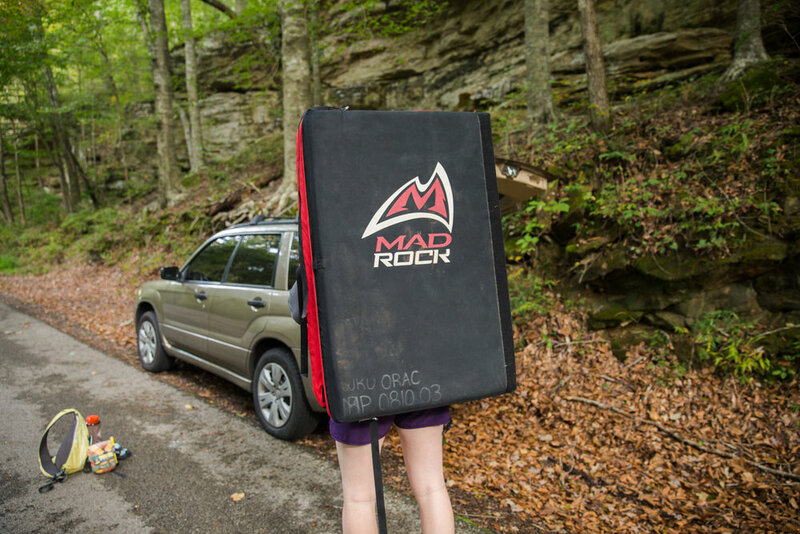 Paige and I haven’t quite made the investment in our own crash pads but thanks to the kind folk at ORAC, we were able to snag two for a killer deal just for the weekend. Clifty Hollow is a small cluster of good ol’ Kentucky sandstone (i'm no geologist so if I'm wrong feel free to correct me) cliffs covered in potential routes. There are multiple established routes listed here, but if you have the time to invest, there are a lot more to be discovered. 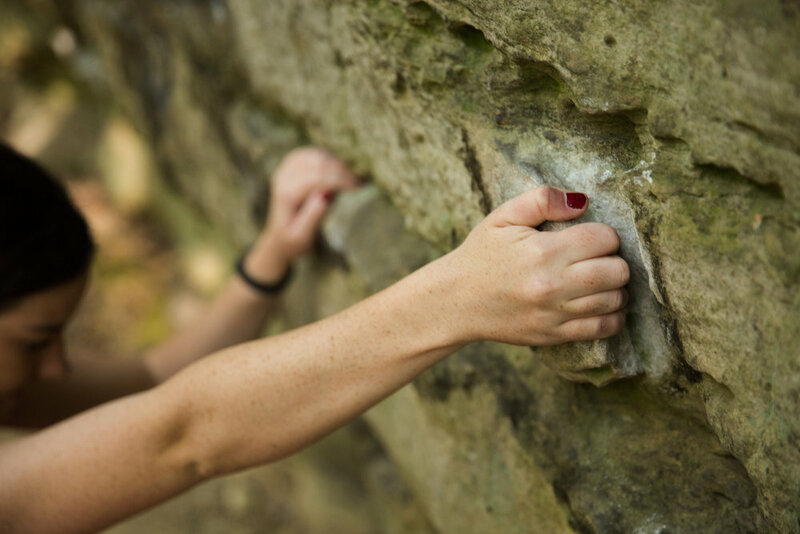 Clifty is only about twenty minutes outside of bowling Green, so for the local climber, it’s a great place to break up the monotony of the gym without having to drive for hours. Paige and I arrived about nine in the morning and didn’t run into anyone else the entire time we climbed. It was a beautiful and peaceful place to spend the morning - besides the graffiti left by the usual hoodlums (why do adolescents and some idiot adults think it’s imperative to their life experience that they leave their name, inappropriate images, and foul language on nature’s canvas? It’s maddening. ), it’s a nice place to blow off some steam on the rocks. My biggest tip for any climber at Clifty Hollow is to keep a huge stick handy so that you can brush off the multitudes of spiders and their eggs that are hiding in almost every hand hold. It’s not for the faint of heart. Though…..I survived and I’m usually an arachnophobe. I told Paige I didn’t know who I was anymore when I readily volunteered to brush off most of the creepy crawlies.